Late newsletter, the second of two big storms in the last week strafed us yesterday afternoon, so I didn’t get to it last night. Lots of sticks and debris blown around and a few small chainsaw sized limbs. 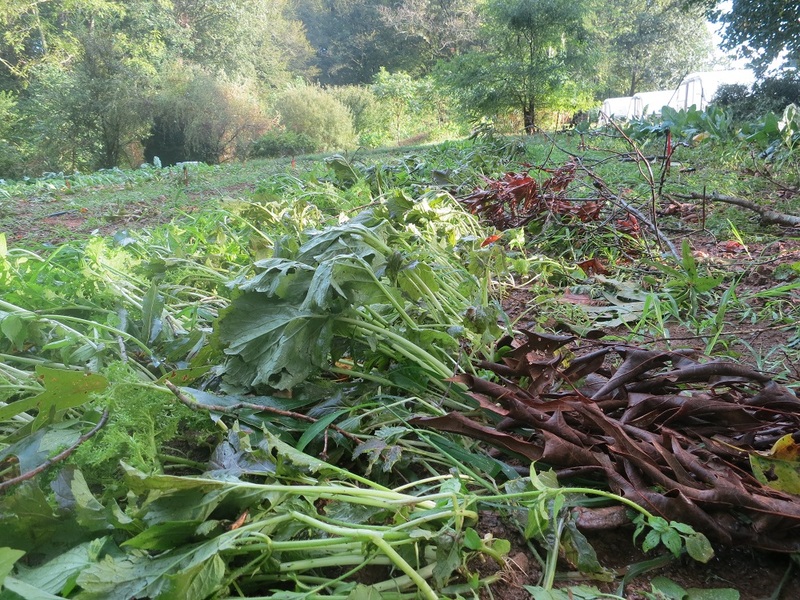 Some of the fall vegetables got knocked around and should mostly stand back up but it has been a hard start for that field for sure. Betsy’s plume celosia took it the hardest as it was by itself out in the middle of the field with no windbreak. Everything else looks OK but wet. Another inch of rain, makes it three inches in the last week and a half. One of those odd times of year when all of a sudden we are wet but the creek is dry and we have been starting to pull water from the upper pond which is our last surface water, after that we have to resort to using well water but I am sure that we won’t need to now that we are this far into the season. If we hang on just a few more days then it looks like real fall weather will arrive. Great class last week at A Southern Season, it was good to see so many familiar faces there and I thought Caitlin did some really great pepper dishes. I spent a good part of several days this week pulling soil samples for soil testing, 25 in all. We are really fortunate to have such a good soil testing lab run by the NCDA and if we have them done in the fall it is even free! We try and do soil tests every year in the early fall so that we can amend our fields this coming month as we get ready for winter cover crops and all of next year’s plantings. What we are monitoring and adding are the important minerals for plant growth and really just four of them Phosphorus (P), Potassium (K), Calcium and Magnesium. All the rest are minor nutrients and are in sufficient quantities in our soils. In our weathered soils we have to replace these more mobile nutrients mostly because every time we sell a tomato or a flower we are exporting nutrients off the farm. What we use to replace them is crushed rock, it is heavy and expensive to mine and transport so we want to add just what we need so the soil tests are crucial to do a good job. It is all just another part of the business.